Sri Krishna Janmashtami is the joyful celebration of Lord Krishna's birth he was born in the 'Rohini' nakshatram. Sri Krishna Janmashtami is on Friday 9 August 2012. It differs in different regions. Sri Krishna Janmashtami celebrations starts in midnight. On Sri Krishna Janmashtami Plenty of sweets are made. Among these are laddus, chakli, avalakki (atukulu), cheedai, payasam and so on. 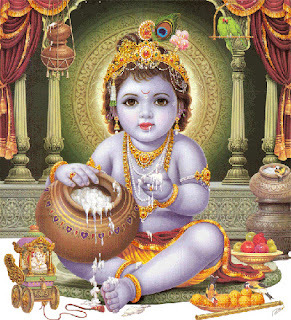 In addition, plenty of milk products especially butter, which was Sri Krishna favorite childhood food, is given in offerings. A wide variety of fruits and flowers are also offered. The most common sweets made laddus and payasam. Mangala Aarati : 4:30 A.M.
Maha Abhishekam : 10.30 P.M.
Maha Aarati : 12:00 P.M.
On the auspious day of Janmashtami childrens were decorated like krishna. Foot prints were decorated in houses from outside to inside, pooja mandir especially krishna statue will be decorated with flowers. Before the krishna sweets, butter and fruits were offered. 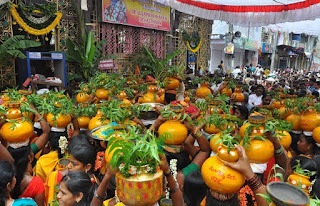 In the evening the handi is a clay pot filled with buttermilk that is positioned at a convenient height prior to the event. Then one by one man is stands like pyramid the topmost person on the human pyramid tries to break the handi by hitting it with a blunt object. This is a symbol of unity.